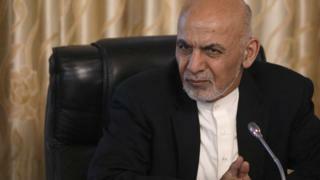 The Afghan president has apologised to women for remarks he made about the traditional headscarf. On Saturday, Ashraf Ghani responded to claims that some government officials have links to so-called Islamic State. He said people should provide evidence or wear a woman's headscarf. It provoked a backlash from people who viewed the comments as sexist. Mr Ghani later apologised to women who felt offended and said his comments had been misinterpreted. In a statement, the Afghan presidential palace said: "The president is a very prominent advocate of women's rights and has taken unique steps to strengthen and preserve their position since his tenure as the president of Afghanistan." It said Mr Ghani's use of the word "Chaadar", scarf in English, had been misinterpreted. It is "a common saying which is never aimed to offend the highly valuable place of women in the country," it added. President Ghani received a big round of applause from the audience after finishing his remarks about the traditional headscarf, but a day later he apologised to women in Afghanistan. Many believed Mr Ghani was suggesting his critics should become women, thus inferring inferiority. Civil society activists took to social media to demand the president apologise for his comments. Some government officials, including female MPs, also reacted angrily. The important context is that Afghanistan is a majority Muslim nation with most women wearing the headscarf. Free Women Writers, an organisation supporting female writers in Afghanistan, issued a response to Mr Ghani's comments on Facebook. "Who can be the hope for Afghan women when their president thinks being a woman as well as womanhood is embarrassing", they said. Fawzia Koofi, a female Afghan MP, tweeted to say she was "proud of wearing her scarf". Mr Ghani was sworn in as Afghan president in 2014, pledging to tackle the issue of corruption as a priority. He had previously been the country's finance minister, an academic in the US, and worked for the World Bank.